Mr. McCabe thinks me a slave because I am not allowed to believe in determinism. I think Mr. McCabe a slave because he is not allowed to believe in fairies. Running dialogue between Christie and Masha and I on the topic of Gilbert Keith Chesterton, author, b. May 29, 1874, d. June 14, 1936, m. Frances Blogg—on account of her surname I presume he'd approve what we're doing here—running dialogue on this giant among Englishmen, anyway, has resulted in all three of us blogging to explain why we love or can't bear him. Christie knows his work intimately and loves him. Masha has read a few of his books and can't bear him. I count his Orthodoxy as one of my favorite books, cried tears the size of gumdrops over his biography of St. Francis, have read a few of his other books to interest if less effect, and still occasionally laugh or well up over one of his poems. And I love him. For a lot of reasons: I like happy-go-lucky people, and I like paradox. I like long sentences. I love his enthusiasm for words and his shameless glory in the magical and traditional and childlike and beautiful. I needed his straw-spun-to-gold thoughts as key to unlock the final gate to a splendid, open realm—this bright kingdom in which sacraments work on body and soul, in which fairy tales are taken to heart. I needed him very much for that. I love him very much for that. And I, like Christie, am often struck by the truth in his statements—some of which, ripped from context and examined at face value, are obviously false. There's no one like Chesterton for gleeful, goofball hyperbole: for instance, the quote at the top of this page. Which of us—including G.K.C. himself—literally believes in fairies? And yet, that statement encapsulates the problem I have with purely rationalistic thinking. Encapsulates it with greater breadth and strength then when he later says, flatly, that "Spiritual doctrines do not actually limit the mind as do materialistic denials." "He is the mocker, the one who seems to write against individuals and for the masses. They are the mocked, the lonely ones whom God nestles close—and I feel Chesterton’s judgment of them; he who calls on the ‘awful authority of the mob’ against my friends who remember that the mob “is nonsense—a sum of negative ones” of people who have given up themselves." The mocker? All that rambling, high-spirited playfulness came off as mockery? Has my inner Jane Bennet failed to see the evil in a good man, or did his high spirits lead him into speaking hurtfully to a friend of mine, or is all this just some big misunderstanding? Is it just that reading works this way, that a phrase that pulls its weight in good work for one reader will leap from the shadows, teeth and claws bared, at another? I liked "the awful authority of a mob", not because I like mobs in general—quite the opposite, actually; I tend to think mobs are unstable creatures, liable to insanity and brutality—but because the words came as part of the point about "the democracy of the dead", and as something of a traditionalist, I desperately want the people of the past to have a voice in the present. But Masha's response was real and emotional, not something to be brazenly argued with; in that situation, the best I can think of to say is, Well, I'm confident that he's a well-meaning person, but I am truly sorry he came off that way. I like the guy, but I suppose he can seem brash. "Here was a man who unlocked all the tightly raveled God-knowledge of my nascent soul and presented it to me: not as a bride, like Tolkien, in beauty and mystery; not as a mother, like Lewis had, in comforting familiarity and profound love and awe and devotion; but as my own child, an impish joyful thing, astoundingly complete in itself, innocent yet immortal, infinitely familiar to me, utterly surprising and unpredictable." I think Chesterton would have loved that. "Impish joyful thing" is a compliment for the ages. I am not likely to top it, so I'll move on to the matter at the core of this dialectic, which is this: how can kindred spirits like Masha, Christie and I have such disparate reactions to the same author, the same words? How is it that I seem to have to look so far and wide to find people who are, like me, enchanted by the vivid contrasts and thoughtfulness at the heart of the Twilight story? Why do people instead get excited over the Hunger Games trilogy, a set of books so overbearingly dark and violent that I cannot to this day think of them without a visceral shudder, the three-o'clock-in-the-morning horror of waking from the kind of nightmare in which your loved ones die in terrible ways before your eyes? Half of you will think I'm nuts for writing this paragraph, but I feel it. How is it that G.K.'s style reads as banter to Christie and I, but as mockery to Masha? It's funny and terrifying and sad and beautiful when like-souled readers respond so divergently to the same work. It's hard to say how much of a reaction is due to the reader and how much to the writer—a fact I feel rather powerfully as both novelist and reviewer. Every reader brings a custom set of sensitivities to whatever they read, and no writer can wholly predict that. But writers are subject to the Book of Proverbs' warning that, "When there are many words, transgression is unavoidable." 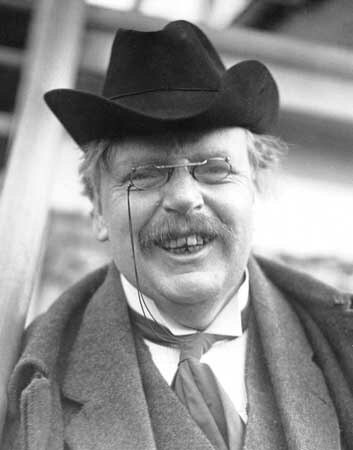 Chesterton wrote with at least the appearance of blithe effusion, as if no qualms over the possibility of his words' permanence could staunch the exuberance. As someone who has probably spent five or six hours on this post already, I fear and admire that freedom. It is impossible that he wrote all those words without error, but he also wrote so much good. In the end, of course, disagreements over mere strong tastes matter little. It's just another curious question among friends—friends who can raise a glass together and toast even the great authors that only some of them love. At least, I think so. I'll happily put one up for The Professor. Or even Suzanne Collins. 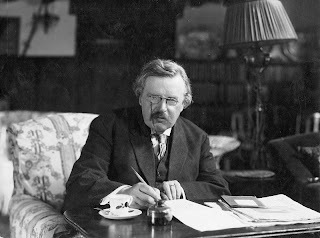 But I'll also tilt up my pint and name G.K. Chesterton, because when I read the cheerful scrawls that make up Orthodoxy, there was a grandfatherly wink in the pages, and the wink came with magic, and the magic was faith. Here stand I for a sign. My cup is filled with wine. Stood up, and drank to God. Hmmmm . . . someone I can't bear. . . No one actually comes to mind. I struggled through The Old Man and the Sea in high school, but with age and education under my belt, I'd probably like Hemingway better. I can see me not liking Stephenie Meyer, but I can't say because I haven't read her yet. As for whether the flaw's in the author or reader, it's probably some subtle combination of both. Each person's upbringing and formed psyche makes her partial to certain impressions and sensitive to topics spoken of without the right delicacy. And that delicacy is dependent on the author, his or her strengths and weaknesses as a writer. This was a great contribution! I don't think you would like Stephenie Meyer. I seem to handle casual prose more easily than most of my literary friends, perhaps because I'm not much of a poet. I'm interested in The Host, and this seems the best way to approach Meyer with as little bias as possible. I really liked this. And I agree that is some combination of writer and reader, it's like any relationship, I guess, so people draw out the flaws in their friends, some draw out the good..And I wonder how much of it is that conflict of types..Christie described him as a very masculine writer (aggressive, would be my term - they both fit ( I don't mean aggressive in necessarily a mean way, assertive would also work)..'a lion'. It fits. And I wonder how much of it grates on me because I know that in me is a similar being - carelessly certain, likeable, harsh. I'm not good enough a person to be that one in Christ, maybe he is..but I need and nurture the thoughtful and receptive in myself..Chesterton would encourage the negatives in me. And I agree that is some combination of writer and reader, it's like any relationship, I guess, so people draw out the flaws in their friends, some draw out the good..And I wonder how much of it is that conflict of types.. I want to hear your fairy-elves-magic thoughts! So..Fairies..Why don't we believe in them?? I'm not saying I Necessarily do..but I don't disbelieve either..I'm more ambiguous on fairies than God, or even ghosts..but not as uncertain as I am about 1+1 always equaling 2 ;)..And I like to give GKC the benefit of the doubt (well, I don't really LIKE giving it to him, but I give it anyway) and assume that he'd be fair enough in a conversation with a determinist to not say "I think it isn't fair that you can't believe in something that - if I'm actually honest with myself - I can't believe in either" just to make a point, though, he's sort of the debater and that seems to be what people do in debates.. So..Christie, Jenna..is he just scoring a point?? And do you with-hold judgement on fairies, or actively disbelieve??? (I ask, heart in my throat! [shameless Firefly quote] ;) ) I think there was more this morning, but Luba killed it with her barking at fairies..or imaginary deer, or whatever haunts her little doggy brain. I almost watched Firefly instead of Doctor Who the other night! I couldn't remember if that was the one you liked or not, so I didn't. But I'll have to keep it in mind for future introvert holidays. Edit: I don't literally believe in any particular image of fairies I've ever read of, but that doesn't mean they absolutely don't exist in some form, and it does my heart good to imagine them playing around in my tulips and fall crocuses nonetheless. All I'll say is that if Chesterton had run into Hermione Granger's parents, they would've been going cha-ching, cha-ching. Haha, seriously! Not that I have room to talk, mind. I wish I had some of Madam Pomfrey's skill, so I could shrink my own front teeth. This is wonderfully written, Jenna, and makes me wish I could join the conversation. Alas, the only Chesterton I've read is the Father Brown mysteries, and that so long ago that most of the details are lost to me... though I was rather fond of the quiet little priest. If you all ever get the chance to see the 1954 Father Brown movie starring Alec Guinness, do so. Brilliant film. Also while Guinness was filming the picture, an incident occurred when he was mistaken for a real priest that helped move him further in converting to Roman Catholicism. Ooh, so that's good, is it? Lou was just looking at that the other day, trying to find us something to watch since we've finished all the currently-streamable Downton Abbeys. :) At least, I think it was that one. I'll tell him we need to see it. Blog discussion topic! But would it go on SSiG or EtS? I'm ambiguous about my belief in fairies. I think they're certainly possible. Why not? If human beings can imagine them, and our imaginations come from God. It all goes back to Tolkien's distinction between truth and fact. It may be that fairies do not exist in fact, but do in truth. Anyway, we know that there are demons and angels. And C.S. Lewis makes a convincing what-if case for spiritual beings that fall in-between the two. And then you have to wonder about the gods of the ancient religions: not the ones that called for infant sacrifices, which, if they ever were inventions of men, were certainly taken on by demonic personas; but the ones that were more benevolent spirits of nature (read Chesterton's "The Everlasting Man"). The ones that make you believe in Ents and the River's Daughter, when you're out in a wood carpeted with bluebells on a sunny spring day. Chesterton speaks right to me, as always. I love, love, love that my Faith leaves it open to me to believe in fairies, within reason. I think that if we were to meet fairies or elves, we'd be surprised to learn they know about God and His Church. Though where they'd fit into the salvific plan, I don't know, and Tolkien leaves it alone, which is appropriate. His elves are bound to Arda, the universe, unlike men, who go out of the world and unite with the One when they die. If you don't understand the sadness of Tolkein's elves, that's a very defining trait right there. In the end, only God could say if He were to extend Christ's sacrifice to other beings; similarly with aliens. Lewis deals with that as well in his space-science trilogy. In summary, I don't think it's a coincidence that the Irish were the most devout in Faith but maintained a healthy respect for Faerie. "There are many things in Heaven in Earth, Horatio, that are not dreamt of in your philosophy." I definitely think it's a point for Chesterton, and through him, for Christ. Which is just what he would have wanted. I do think that Chesterton is aggressive, assertive. I'm obviously attracted to that kind of writing and approach, as I've very few favorite female authors. Flannery O'Connor tends to be "masculine" like that: no nonsense, a tad judgmental if in a good-hearted way, rational rather than emotional. . . though in her stories she attempts emotional heights, the unapologetic severity of them strike me as more on the male side of the yin-yang. I suppose that where legends are concerned, I think less in terms of belief and more of allowance and hope, but I like having the freedom to hope for the existence of elfin things, too! Fairies, life on other worlds, magical creatures... Science and I don't get on very well sometimes. :P But I'm perfectly happy to accept science for what it is, as long as it keeps its grubby hands off myth and mystery. Fascinating point about Chesterton's assertiveness and the masculinity of that approach. I suppose he is, though I'm not usually attracted to that. I usually go for empathetic and gentle. But I also like bright-spirited, funny and happy, which is where the Chesterton appeal comes in. Not that I have much to contribute but I saw this quote on Facebook today so thought I would add it. ~Dororthy L. Sayers: Preface to Chesterton’s play “The Surprise,” London, 1952.